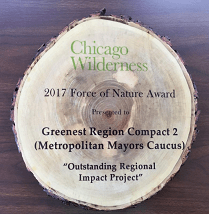 I don’t think they would be too good for dunking in a glass of milk, but the ‘tree cookies’ serving as plaques for the inaugural Force of Nature Awards presented by Chicago Wilderness sure have a tasty design. The unique tree ring plaques, still framed by their bark, were crafted from a tree removed from the Cook County Forest Preserves by the CCFP’s sign shop foreman Roy McNaughton. You can view photos of McNaughton’s handiwork and read about the awards in this month’s Illinois Wood Update. Also in the October edition, learn why Schmidt Custom Floor joined the urban wood movement. The Waukesha, WI, company’s story is but one of many company profiles featured on UrbanWoodNetwork.org. This month’s featured video shines a spotlight on Richmond Hill’s emerald ash borer management strategy, which includes utilizing as many of the infested trees in the Toronto suburb as possible. Do you have urban wood news, stories, events to share? Then send it to us at info@illinoisurbanwood.org.